Grinning like the Cheshire Cat… Grin now; you won’t feel like it later. Here’s something for the whole world to be ashamed of. In 2018, the leading cause of death, world-wide, was… abortion! (https://www.wnd.com/2018/12/shocking-statistic-shows-planets-leading-cause-of-death/) Yup, 41.9 million babies were aborted this past year, far outstripping the second-highest cause of death, cancer: 8.2 million people died of cancer. Even more incredibly, for every 33 live births on the planet, there were ten abortions–that’s almost a full quarter of all babies conceived. Including 60% of all black babies in America. These are World Health Organization stats. Which country has the highest abortion rate? I can’t tell you that: the list is different in every article you read. But one thing that does come across is that wherever you legalize abortion, you get more abortions. Sort of like legalizing pot. I don’t know who said this, but whoever it was deserves a round of applause. Man: God, why didn’t you give us a cure for cancer? God: I did, but you aborted him. This has to change in 2019. We have to try to change it. The Lord our God will require of this age all the innocent blood shed under its auspices. 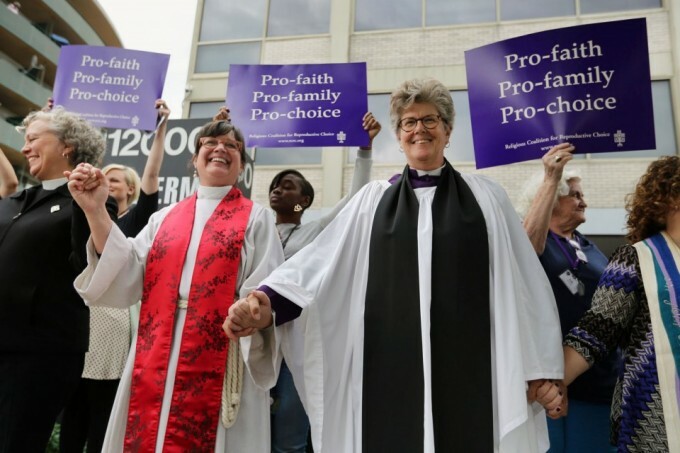 “Clergy for Choice”–consider well your works. You never know when it’s too late to repent. Claiming, as you do, to speak in God’s name, you ought to know your punishment will be severe. The Lord doesn’t like false prophets. You could look it up. This entry was posted on Tuesday, January 1st, 2019 at 11:12 am	and tagged with "Clergy for Choice", abortion statistics, abortion was leading cause of death in 2018, false prophets, the abortion holocaust and posted in news. You can follow any responses to this entry through the RSS 2.0 feed. « You May Have a Future as Compost! I don’t know which is more frightening, that statistic, or the looks on the faces of the people in that photo. There may be wearing clerical garb, but one gets the impression that they aren’t about to listen to any opinions which differ from their own, even if God Himself were the one talking. They reckon God isn’t paying any attention. They’re wrong. That’s a common mistake. Just because He doesn’t strike one with leprosy, doesn’t mean that He isn’t aware of what we are doing. When the Great White Throne Judgment comes to pass, we will be judged according to our deeds. We are offered forgiveness but that requires that we strive to conform our behavior to God’s ways. He is, indeed, speaking, but sinful man is not listening. This is a shameful situation, worse than in the days of Moloch. America used to be a country of moral principal. We were far from perfect, but at least the prevailing options of decency were rooted in biblical morality. That sure has changed over the course of my lifetime. That should read prevailing NOTIONS. * Pro-Family – and its right to dispose of any family member who seems bothersome to any other member of the family. * Pro-Choice – except for the person being killed, who has no choice in the matter. It’s an example of perverting meaning, something common in our day. These are just slogans at this point. We live in a world where advertising manipulates language in hopes of persuading people, not necessarily because of the virtues of a product, but because of the mental picture the advertiser paints and attempts to associate with the product they are trying to sell. The reason abortion is legal in America is because of the Roe v. Wade decision (which was based on a lie). It was decided by Leftist judges. When Rightist judges control the Supreme Court (and we are getting closer to that) they can overthrow “Roe” just like Plessey v. Ferguson was overturned after being the law of the land for 58 years. If courts are going to make “laws,” why doesn’t the legislature just stay home? To this day, I will never understand why babies are not the most protected.